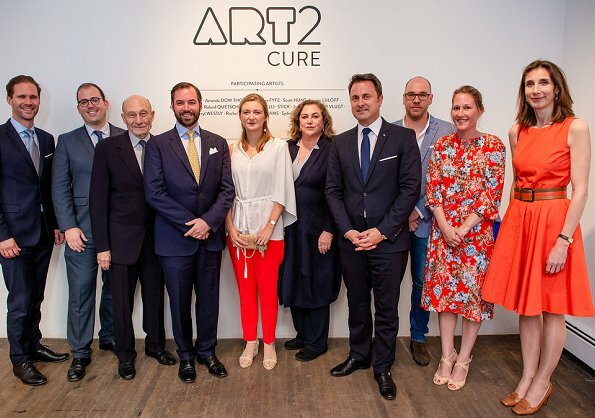 On May 21, 2018, Hereditary Grand Duchess Stephanie and Hereditary Grand Duke Guillaume attended the opening of "Art2Cure" exhibition held at Ronald Feldman Gallery in New York City. 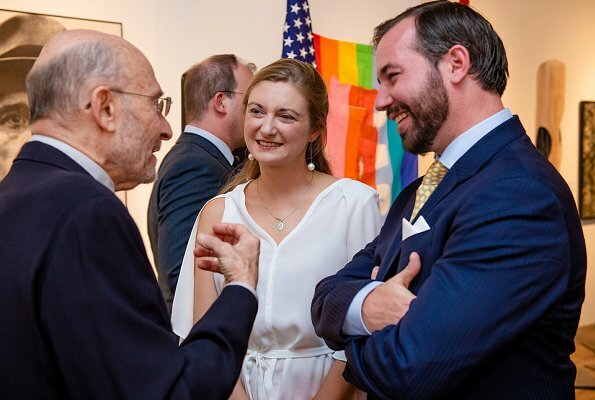 Art2Cure is a non-for-profit organization founded in 2014 in Luxembourg that organizes art exhibits to raise funds for biomedical research in various fields, including neurodegenerative diseases. 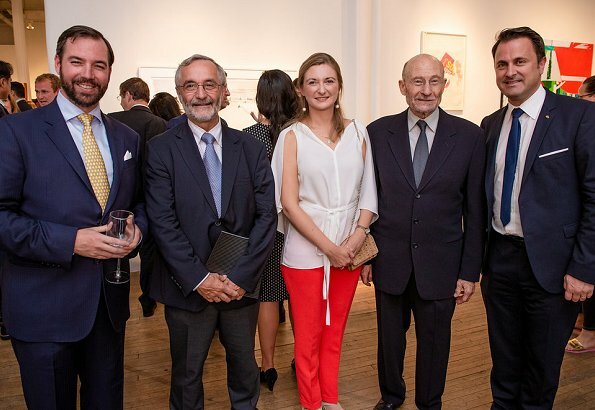 Funds raised from the art sales during the New York Premiere will support a research collaboration on Parkinson’s disease between Columbia University and the University of Luxembourg. Very nice top, terrible pants. A wider leg, grazing the tops of the toes, would have worked. :-D I was about to say that the pants could have worked with something more modern, but this blouse looks like if was on sale at C&A two years ago...And please tell me she is not wearing socks in the sandals?! I am afraid she is :-((((( And I guess C&A online sale is exactly where she bought the whole stuff, including the fake pearl ear pendulums, the tiny rattan handbag, the plastic clip and the granny sandals. I agree, it is a sad, casual look for her station in life. Those who arrange these events deserve more respect. I quite like the orange dress of the lady on the right. It would have suited Stéphanie well and would have been a much better choice for this occasion. It is strange that she gets it so right sometimes and so wrong in between. This was not good. But the pants were better than those old black, wide ones! That said, she is my favourite royal. I wish I was her stylist! Oh, dear! What a mess! There is nothing here to salvage. She can dress so beautifully on occasion and then look like a mess at other times. Oh, dear. Stephanie has proven that she can do better than this. If you are going to wear fire engine red, it must be perfectly tailored because that color will draw everyone's attention and scrutiny. At the very least, make a bit of effort with your hair, please. Hair is a disaster. And the outfit os too casual IMO. Poor image of Luxemburg. I like the outfit. It is not a wowwowwow-outfit, of course, but it's a nice outfit. The trousers have a nice colour, her style looks fresh and young. The two ladies in red and the one in black make all an effort to look best for the occasion. The HGD maybe did, but it does not show. The trousers are not bad, but you need other shoes. Flats or filigrane heels. The top is, well at least comfy. Same for the shoes. The earrings are nice and the hair is not that bad. Clips are comfy too. She seems not being interested in fashion. Some members of old aristocratic families are not. They simply do not need to impress. I’ ve also got the impression that she’s not interested in fashion. If she had a good stylist she wouldn’t have to bother much, just wear what the stylist recomends. She seems like a very nice person who takes her job seriously, but being well dressed is a part of her job. I like the top, but these trousers were not the right complement. The colour is fine, but she needed a wide leg, and very sharp tailoring. Her shoes are a desaster. Strappy heels would have provided the necessary polish. I don´t mind her hair as much as other do, although I agree that it looks a bit sloppy. Earrings are great though. Oh dear a terrible look for Stephanie she can do a lot better than this. I hate to say it but it looks very cheap (as in inexpensive). She may not be interested in fashion but as a member of a royal family surely she could have a stylist who could guide her to dress on a more flattering way. Her mother in law always dresses to suit her body shape. Poor Stephanie. I hope she doesnt read this block. If she wears pants then it is too wide and too long. This style pants length is right. The crown princess goddess and holy saint victoria croan prince mary and princess marie wearing the same style pants then the comments get hysterical how stylish and stunning they look. I dont believe she is wearing plastic clips in her hair. This oufit of stephanie match the visit to the art gallery. The other ladies also in red. 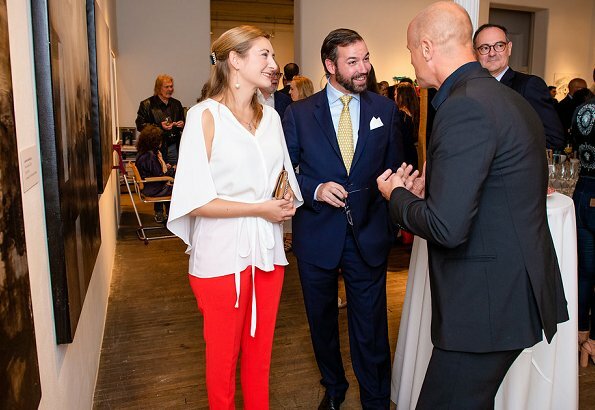 Maybe a connection between the gallery and colour red. You obviously don't see the difference if a pair of pants fit or don't fit. If they suit the figure of somebody or don't. But this is what makes all the difference, this is what makes an outfit a top or a flop. And this is what we discuss here on a fashion blog. Victoria by the way earned some critical comments lately for some bad fashion choices. But nobody attacked her personally like you do. The words you are entitling her with show a lot of immaturity. But keep on nagging if it makes you happy. Nobody cares. I love it when you take the bait Beth!!!! It is my opinion. Face value I appreciate the clothes royalty are wearing. I am not designer. You must still make the change between a fact and an opinion. You dont know the difference between the two. You force your opinion as fact on the blog. Please give us the name of your fashion house to look at your designs. Immaturity and nagging past my age. Keep well! >>....when you take the bait...<<< I forgot, that this, the bait, is what you are aiming for on this blog. Stupid me! I don't own a fashion house. But I have worked long enough for one to be able to see if a dress fits or it does not fit. This is based on size, color, cut, fabrics, material, art of sewing, design. And this is what is called facts. The rest is your opinion. I leave it to you.